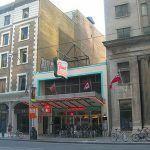 Click on the interactive red tabs to explore significant places in Glenn Gould's life in Toronto. Use this page on your smartphone to explore some sites, or print the pocket guide! Download and double-side print the Tiny Guide to take on-the-go! Click here for assembly instructions. Naming the major radio performance studio in the Canadian Broadcasting Centre after Glenn Gould is a living testament into the future of this great Canadian's intense and creative relationship with the CBC. From the earliest years of his career, Glenn Gould was fascinated with the possibilities afforded by radio, tape and the recording studio. From his CBC Radio broadcast debut on Christmas Eve, 1950, through the intricate radio documentaries of the 1960s and 1970s, the CBC studios were a playground for his powers of invention. 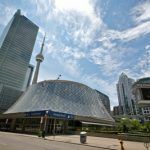 Throughout almost a decade of international touring and public performances (1955-64), Gould regularly played studio recitals, appeared with the CBC's radio orchestras, and gave on-air interviews and talks on musical subjects. 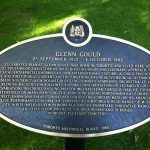 The studio holds an excellent display of photographs on Glenn's life, a colourful collection of covers from his many long-playing discs, and the Chickering piano of his youth as well as the infamous Glenn Gould Park Bench Sculpture. 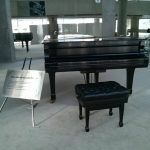 Visit this landmark and submit your photos with the Glenn Gould Sculpture with your name and city. A symbol of excellence that acknowledges the achievements and accomplishments of successful Canadians. 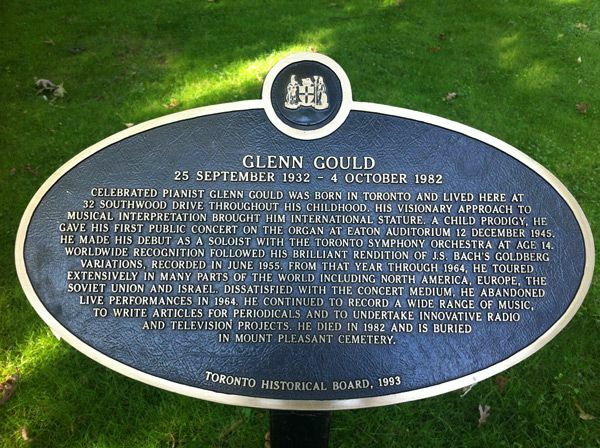 Gould died of a stroke at the Toronto General Hospital on October 4, 1982. A large public funeral service was held at St. Paul's' Anglican Church, 227 Bloor Street East. It was attended by more than 3,000 people. He is buried in the Mount Pleasant Cemetery Grave No 1050 Section 38. The cemetery office is often asked for instructions on finding his grave site. The beneficiaries of his will were the Salvation Army and the Toronto Humane Society. The grave marker is modest, made of grey marble and inscribed with the opening bars of the Goldberg variations. 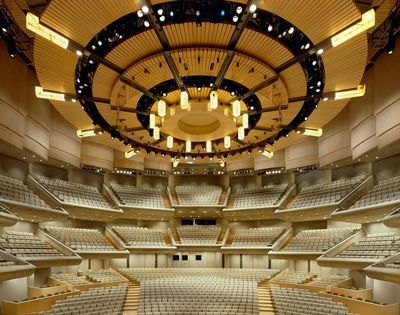 A sitka spruce was planted on the site by Sony executives during the 1992 Glenn Gould conference, organized by the Glenn Gould Foundation. The Russell Herbert & Florence Greig Gould family home in the comfortable Beaches area of Toronto. Southwood is a hilly, treed and quiet street not far from Lake Ontario. "The young Gould had many pets, including goldfish named Bach, Beethoven, Chopin and Haydn. His succession of dogs included Sindbad, Sir Nickolson of Gairelochhead, and Banquo. He had rabbits, turtles and a non-deodorized skunk but their names are not on record. It would not surprise me to that the skunk's name was Stravinsky." - Geoffrey Payzant. There was also a bird named Mozart. 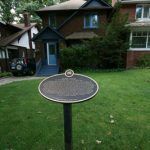 Robert Fulford, a distinguished Canadian author lived next door. Gould’s father Herbert "Bert" Gould, a furrier, was also an amateur violinist, His mother Florence taught him his first piano. By the time he was five, he was composing and performing his own piano pieces. 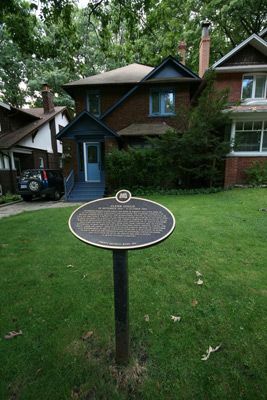 The house, a designated historical site, has a plaque in front of it but is otherwise very ordinary. 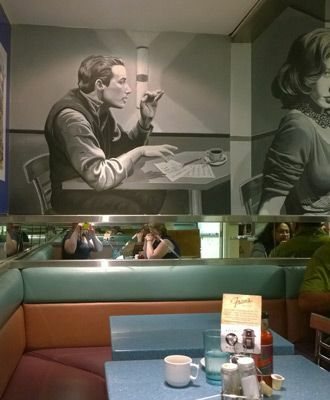 A favourite dining locale of Glenn Gould, Fran's Restaurant has been in business in Toronto for over 65 years. 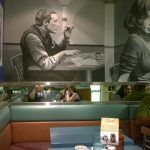 They are perhaps best remembered for their home cooking, as well as for being open 24 hours a day. 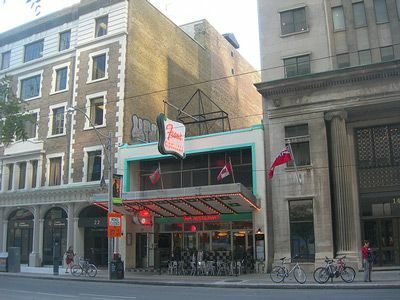 South Side of King Street, just East of Duncan. Gould’s penthouse apartment at St. Clair West and Avenue Road. He used it mostly for sleeping and practicing piano. His possessions and private archives were stacked there in heaps. It was furnished in "vintage Crippled Civilians" style. Ruth Pincoe, who sorted and organized his papers after his death said she spent the better part of the first week just putting record albums back into their jackets. He kept the Chickering piano of his youth there. Guests were warned not to lean against it lest it fall apart. There is no admission to the general public for this building. Marilyn Kecskes was superintendent of 110 St. Clair Ave West for many years. She first met Gould on the elevator when he was wearing gloves and covering his face with a handkerchief for fear of catching her germs. She knew he was special because his mailbox was the only one in the building that had been tampered with... someone had tried to force it open in hope of getting a bit of his mail. A small municipal park just west of Gould's St. Clair Avenue West apartment. 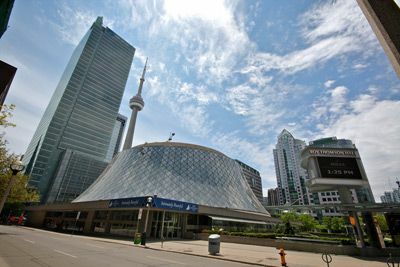 The Toronto Music Library was located on the opposite corner until consolidated with the Main Toronto Library at Yonge and Bloor. Note the statue of Peter Pan. Glenn's Yamaha Piano, model CF II, was used to produce his latest and very famous recording of J.S. Bach's Goldberg Variations. 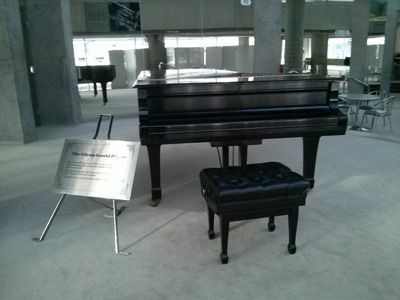 The piano is now in permanent residence at Roy Thomson Hall in the internal lobby. Please note, however, that this lobby is not open to the public. 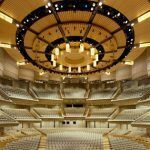 Visitors not attending concerts can arrange a group tour for 10 or more or inquire about other visiting options at the Roy Thomson Hall Volunteer Office at (416) 593-4822 ext. 322.